Lamb ribs, necks and leg steaks are cheaper and perhaps even more delicious than lamb chops and racks. Here, how to cook these bargain cuts. Necks, ribs and leg steaks are less expensive and arguably even more flavorful than chops and racks. Here's how to cook these overlooked cuts. Eating just the most popular cuts of lamb, like the chops, is like only visiting the major tourist sites in a city: You miss out on so many other things to discover. 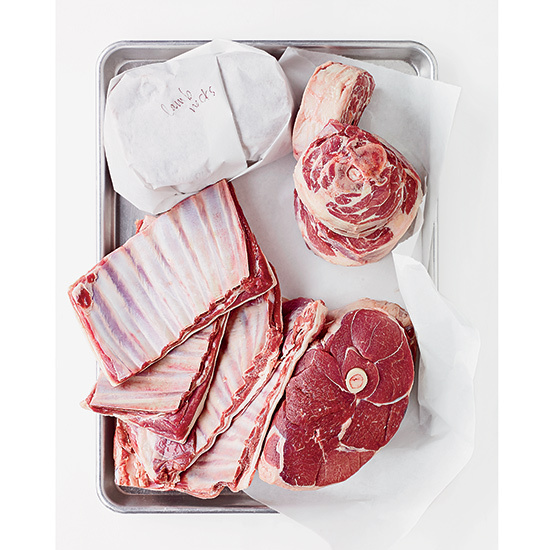 Here, Boston chef Tony Maws, a master of whole-animal cooking at his restaurants Craigie on Main and the new Kirkland Tap & Trotter, shares his favorite ways to cook lesser-known cuts of lamb. According to Maws, they are some of the most flavorful parts—the trick is knowing how to approach each. For tough cuts like the neck, that means slow braising; for fatty ribs, slow roasting; and for leg steaks, quick cooking on the stove. Season a 9-pound, bone-in leg of lamb with salt and pepper. In a large, oiled roasting pan, sear the lamb over moderately high heat until browned. Add 1 quart low-sodium chicken stock, 1 bottle dry white wine and 5 sprigs each of parsley and thyme. Cook in a 275º oven for 2 hours, basting every hour. Cover with foil and cook for 5 hours longer, until the meat is tender and pulling away from the bone.